One of my favorite parts of sewing along with all of you is seeing all the different variations of the patterns we're using. 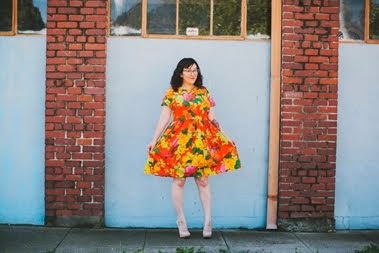 Different colors and prints, fabrics, modifications, and added details can make a completely different look that I hope will inspire some of you who haven't yet made the pattern. And even if you have made the pattern it's so fascinating to see what everyone else made. It's eye candy either way :) Below I have featured just a few of the ladies who sewed the Taffy. 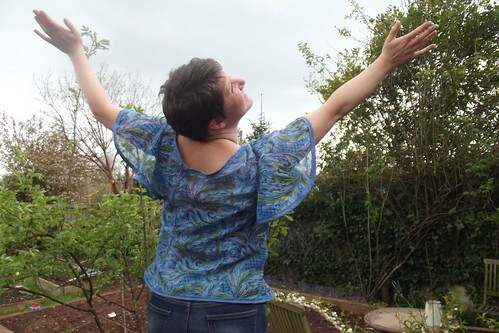 Ruth finished this top back in January and posted this adorable photo in the Sew Colette Flickr group. I love the blue/lavender accent from the bias tape. The fit looks spot on too. The Queen of Cool Modifications aka Rochelle from Lucky Lucille, once again made me say, "what a great idea!" I never would have thought to finish the sleeves the way she did. In her blog post she mentioned that the sleeves took a while to do, but I think it was well worth the time spent, don't you? Charlotte's version uses such a cool fabric, perfect for spring. I love her pose too :) Check out her post to see her fellow model and cute shoes! Both Ruth and Charlotte's blouses turned out absolutely beautifully!! It makes me wish I attempted a nicer sheer fabric like theirs. Very well done ladies! I'm happy you're inspired by my sleeves! 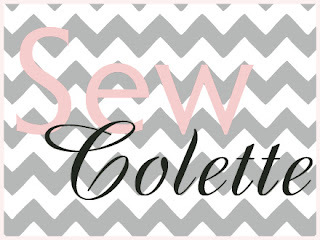 I think we have the same sewing machine, if not very similar versions, so I bet yours does the exact stitch I used! What beautiful Taffy's!! I hadn't seen Ruth's - its wonderful! She really got the fit spot on! Thanks for sharing. I agree that Lucille's medications are always spot on and uber cool! there are so many amazing taffy's I can not wait to give it another go now I have been inspired by everyone else. What fabulous pieces of Taffy!! They are all stunning! UGH so lovely! I'm currently cooling my heels as my fabric for Taffy prewashes/dries...this is perfect motivation while I wait!